Your own material to dye. Fibre must be natural – cotton, linen, wool, silk, rayon/viscose, hemp etc, as synthetic fibres will not absorb the dye. Examples of items to bring: scarves, pillowcases, tops/blouses/tees, jeans, lengths of fabric, tea towels, napkins etc. Please feel free to bring a bunch of small items (like the ones listed), large items are a bit harder to dye as the vat is being shared amongst a number of people. This workshop is MESSY! Wear clothes you don’t mind getting a whoops on! 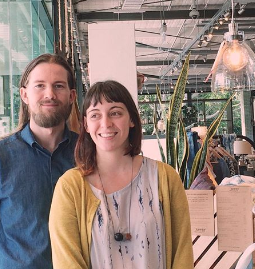 Tawny Threads is a textile studio based in Brisbane, and is operated by Claudia Husband and Chris Hagen. Our main focus is the design and production of textiles in the form of printed, dyed and woven fibres.